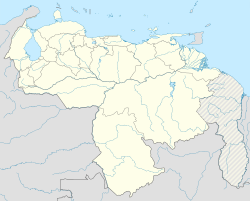 Turmero is a city in the state of Aragua in northern Venezuela. It is the capital of Santiago Mariño Municipality. The city was officially established on 27 November 1620 with the founding of a church, Iglesia Nuestra Señora de Candelaria, in an existing village. Wikimedia Commons has media related to Turmero. This page was last edited on 6 February 2018, at 00:08 (UTC).